Another view of Angels Creek Bridge, which is part of the Angels Camp Bypass. It's a three span bridge on single column bents and seat-type abutments. Note the two-way flares at the top of the columns. Also, the facing stones on the outside of the barrier railing. Today, each highway project must have a visual theme. 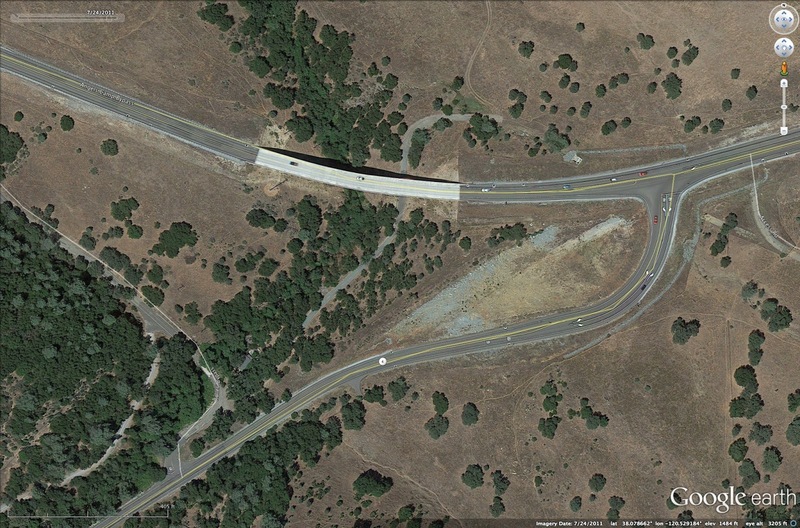 For instance, we saw that all of the bridges in the Amador City Bypass had a similar appearance. This new highway carries about 10,000 vehicles a day. In the Google Earth photo above, we can see the road that runs alongside of the creek. On the left side of the photo is another Angels Creek Bridge (on the old Rolleri Bypass Road). I tried to walk along the road to photograph this bridge but it was blocked by a locked gate. Calaveras County, California Bridges: Angels Camp Bypass across Angels Creek (2) by Mark Yashinsky is licensed under a Creative Commons Attribution-NonCommercial-ShareAlike 3.0 United States License.